Axed Linlithgow Rose boss Todd Lumsden believes the club hit the panic button by sacking him following Monday night’s loss at Newtongrange. Rose have been plunged into a relegation battle and the club committee decided to make the change with the club second bottom of the Superleague. 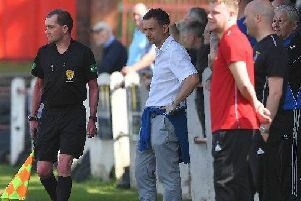 Former Newtongrange boss Alan Miller and ex-Berwick manager Jimmy Crease have been put in interim charge for the moment. But Rose were beaten again on Wednesday when they went down 1-0 at Hill of Beath. They have won just once in 12 games and haven’t won at all at Prestonfield since August. They do have games in hand over their rivals to avoid the two automatic relegation spots or one play-off place. But three of their remaining eight games are against three of the top four sides - Kelty Hearts, Bonnyrigg Rose and local rivals Bo’ness United - and they also face three crunch showdowns with Musselburgh (twice) and Jeanfield Swifts, the two sides immediately above them in the table. Lumsden, who succeeded Davie McGlynn earlier in the season, believes there were enough games left for him and assistant Steven Hyslop to have turned Rose’s fortunes around. Lumsden believes he could have guided Rose to safety from relegation over the closing weeks of the season. He said: “The committee said the players aren’t good enough but I’ve never once used that as an excuse. We’ve just tried to get the best out of them. “I’d have been confident of winning on Wednesday [at Hill of Beath}, I’d have been confident of winning on Saturday, I’d have been confident of winning on Monday. “That’s nine points so maybe getting rid of us was the wrong thing to do. “They were raving about the team that played Auchinleck so what’s changed in a week and a half. “If you look at the statistics I think we have the second or third best defensive record in the league. We just didn’t score enough goals because we didn’t take chances. “I think they could have been a bit stronger in standing by their guns.